Pulcini Press - publishers of books in English based in Italy. Pulcini Press is a small publisher of books and ebooks. Brian and Lynne Chatterton founded Pulcini Press in 1999. A year earlier we had written Discovering Oil. We had submitted the manuscript to half a dozen or so publishers in Australia as we felt that the rapidly expanding olive industry in Australia and New Zealand would benefit from some of the Italian experience. Olives have been grown for millennium in Italy and the country has a network of olive research centres that keep the industry in touch with the latest techniques. The manuscript was rejected by all - not just rejected but with insults and idiocies. There were some publishers who said the book was too technical - others that it was not technical enough. One even queried that Italy knows anything about olives and olive oil. Most seemed worried about promoting the book as we do not live in Australia. Rather than sending the manuscript to more publishers and receiving more stupid rejections we decided to publish it ourselves. We felt with our previous books for Cambridge University Press and Food and Agriculture Organisation we were not exactly novice writers. Publishing friends warned us that selling even 500 copies would be difficult as we lacked a public profile and distribution network. They said that vanity publishing was a bottomless pit for our money. Our first print run of 500 sold out within a year. It took another couple of years to sell the second print run of 700 copies and we are still selling our third print run. The name Pulcini (pronounced Pulchini in English) comes from our farm near the borgo of Castel di Fiori. It was established by the monks from a nearby abbey in the 12th century and has been recorded on maps for hundreds of years as "valle Pulcini". It tanslates as "valley of the chicks." We thought "chicks' press" was a very appropriate name for our tiny publishing venture as long as people did not associate it with chick lit. The success of Discovering Oil encouraged us to publish the other books listed below. None have yet sold as well as Discovering Oil but over the last 12 years Pulcini Press has managed, much to our surprise, to break even - in fact slightly better than break even. We have had a great deal of fun and made lots of new friends in the olive growing and food community around the world. We hope you enjoy reading these books as we have enjoyed writing them. With the launch by Amazon of their self publishing section for Kindle we have decided to put some of our books onto the Kindle platform. It allows us to distribute our books around the world. Everything you wanted to know about olive growing in an easy to use ebook. The scores of photos makes operations such as pruning and picking easy to understand. There are sections on marketing and the problems facing small growers. Processing and quality are included. Brian Chatterton writes about olive oil from the viewpoint of more than 20 years experience as a grower. He explains the grades and the search for an olive oil with a flavour punch. The chapter on health removes the hype from the debate to provide a realistic assessment of the benefits. How can we eat well – or even enough – when climate change threatens to bring droughts, famines and an end to fish stocks? What hope have we got when supermarkets offer arrays of processed foods haphazardly labelled, and celebrity chefs dazzle us with their tricky, costly suggestions? The answer is simple: cook your food at home and learn once again to use ordinary vegetables and fruit, meat as well as fish for meals that are both tasty and easy to prepare. This book shows how. 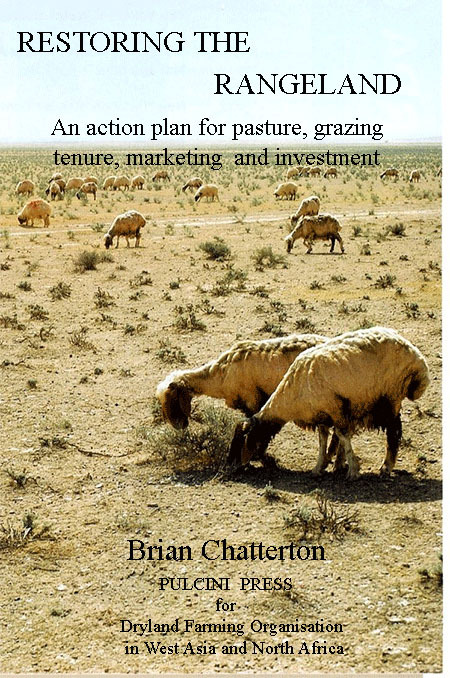 This short book provides an action plan for pasture, grazing, tenure, marketing and investment in the rangeland areas of North Africa and West Asia. 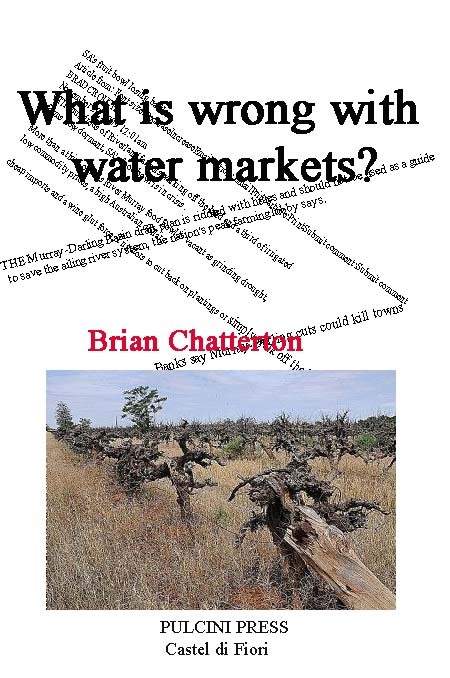 This ebook describes the failures of the water market in Australia during the severe drought in the early 21th century. It explains how a single generation of irrigators have grabbed to water resource of the Murray Darling from the Australian community and how the Australian taxpayer is not purchasing water rights in order to maintain the value of this water grab. The ebook provides alternative models that distribute the resource more fairly not just in Australia but in other countries with water scarcities. Also available as a paperback in English and shortly in Farsi. DISCOVERING OIL - Tales from an olive grove in Umbria. A practical guide to growing olives in the Mediterranean, southern Australia and New Zealand. This book covers all the operations in the grove including pruning, picking and landcare. It is based on our own experiences in restoring an abandoned grove in Umbria. 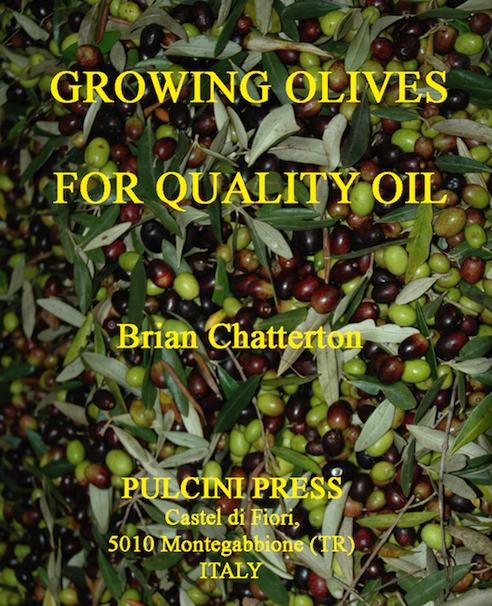 There are also chapters on processing and the quality of olive oil. Lynne Chatterton gives us glimpses of her life as she progressed from a small outback town in Australia where she grew vines and oranges to a small farm in Umbria where she and her husband Brian now live and produce olive oil. Life on the land has been a constant in this journey. The Chattertons have protested farming interests as farmers themselves, represented farmers in government, helped Arab farmers to find a better way of farming in the Middle East and North Africa and championed the cause of farmers in the international agencies. But this is not a book just about farming - it is a reflection on change and its consequences. Fate has many surprises in store for us all - this is an account of one life and a chain of event that created many challenges. A witty and ironical account of Brian's life in politics beginning as a humble back bencher in the Legislative Council of South Australia and progressing to Minister of Agriculture. Brian's political career began under Don Dunstan and progressed or perhaps more accurately declined under his successors. This is not a tale of Ministerial pomp and circumstance but a memoir which begins with the hopes and disappointments of an aspiring candidate, examines the limitations of Ministerial power and finally asks if there is life after politics? Why is agricultural production in West Asia and North Africa falling even further behind other regions with similar climates? Why is soil erosion and land degradation continuing at an alarming rate? The site gives some answers but more importantly provides an alternative farming system that will increase farmers profits while reducing the impact on the environment - both in terms of soil erosion and energy usage The Zaghouan 4 rotation is particularly suited to small farmers unable to afford mechanisation yet unable to compete without it. Sheep and wheat are the staples of dryland farms in the West Asia and North Africa region. The farming system introduced with the great development wave of the 1950's is proving unsustainable. Innovative farmers in similar climates in Australia discovered solutions to the challenges of the Mediterranean climate. Why have attempt to transfer this knowledge foundered? Can experts really understand the practical problems of farming? This book pulls apart the warp and weft of development on dryland farms to try to find some answers to these questions. Now being translated into Farsi. In spite of the numerous and unforgivable typing errors and poor layout this book contain much useful information on medic pasture. It is however a little dated as it was published in 1989 and the Dryland Farming Organisation web site provides more recent information. Extravergine Olive Oil from our own olive groves at Podere valle Pulcini. Castel di Fiori, ITALY.